Recipe courtesy of Edward Levesque, Owner/Chef, Edward Levesque's Kitchen. 2. Heat the olive oil and butter in a large frying pan until almost smoking. 3. Add the garlic, dried sage and shallots or red onion and saute for about 1 minute. 4. When garlic is almost brown, add the mushrooms and saute until lightly browned, about 5 minutes. 5. Add the wine and continue to cook on high heat until liquid has reduced to a few ounces. 6. Add chopped parsley and chopped fresh sage and cook for another minute. 7. Season the mushroom mixture and remove the pan from the heat. 8. Arrange the mushrooms on top of the buttered toast slices. 9. 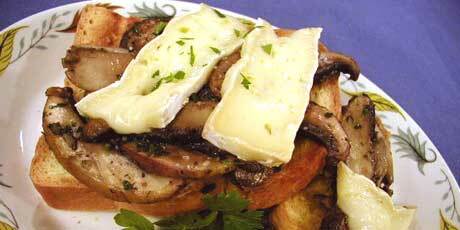 Put the Brie slices on top of the mushrooms. 10. Place the toast slices on a baking sheet and put the baking sheet in the oven. 11. Remove when the Brie is runny, about 5 minutes. 12. Put the toasts on serving plates, drizzle with a little olive oil, sprinkle with parsley leaves, and serve.